If you’ve ever read the back of your pet’s food package, you know how many ingredients there are. Many of these things are hard to pronounce, let alone understand. Let’s face it: the topics of nutrition and weight control can be confusing, even for the most seasoned pet parent. If you need a little guidance in this area, you’re not alone. More importantly, we’re here to help! Lainer Animal Hospital offers comprehensive nutritional guidance and professional weight management services. What your pet consumes can mean the difference between simply surviving and truly thriving. Yet with literally hundreds of different foods to choose from, figuring out which one is the right fit can be challenging. Additionally, some species, such as exotics, have special dietary requirements. Our team is knowledgeable and experienced in identifying the unique nutritional needs of each patient. 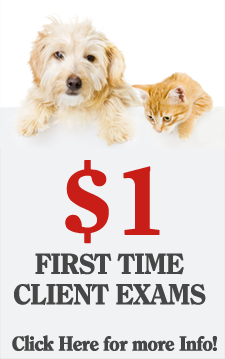 We can assess your pet and determine just what food would be perfect for him or her. A few extra pounds for a human may be no big deal but, for a pet, it can lead to serious health problems. Obesity can even shorten a pet’s life. That’s why making sure that your loved one maintains a healthy weight is so important. We can help by determining which range would be ideal for your particular pet and then developing a strategy for achieving that goal. Through things like proper diet, exercise and calorie control, we’ll get your companion on the track to optimum fitness in no time!